Anchan ran for a few minutes but what felt like hours to the place where she knows Shuka would be at a time like this. To the only place Shuka would be. And when she reached the said place and saw Shuka facing the view beyond, it was as if, time had stopped. The wind was blowing so it added a little bit of effect. Shuka was standing there, back towards Anchan. Shuka didn&apos;t even knew Anchan was beyond her, she just kept staring blankly at the beautiful view beyond. For some reason, Anchan couldn&apos;t dare go near her, not after what they just went through earlier. Anchan needs to apologize, she knows that, but looking at how peaceful Shuka looks like right now, she doesn&apos;t want to disturb that. But for some odd reason, may it be the wind, that blew Shuka&apos;s attention towards the staring Anchan. "I suppose you&apos;re right" Shuka chuckled a bit and turned around to look at the view again. Anchan went towards her now, each step a sounding hesitation. "Loving me" Anchan regretted saying that, cause she heard the most painful reply she has ever head. "Hmm yeah" Shuka&apos;s giggle was nothing short of amused, in fact it was bitter. Anchan stayed quiet, even thinking of just going and letting Shuka be if it weren&apos;t for the said girl&apos;s next statement. "You know Anju, it was never in my intention to tell you that I told you so. I was just genuinely worried. And I guess that&apos;s what makes love itself hard. You&apos;ve completely devoted yourself to the person you love to the point wherein what hurts them, hurts you too" Anchan&apos;s facial features tightened as she heard Shuka say that, yet she didn&apos;t say anything, she just kept quiet. "You didn&apos;t ask why I want you to stop doing the flip right? Well, I&apos;ll tell you. It&apos;s not only me being worried, it&apos;s not only my &apos;girlfriend duties&apos;, it&apos;s not me being insensitive to what you really want to do. It&apos;s just...well if you want me to put it in words...it&apos;s just me, loving you too much that what hurts you hurts me too. I love you too much that seeing you suffer, it&apos;s like half of me suffers with you. Seeing you try so hard to make things happen, in being strong and being our leader, it makes me want to try hard too. You&apos;re not just my "girlfriend" Anju, you&apos;re half of me. So what you do affects me a lot." Shuka said as the bitter smile never left her face but tears came rushing down. Anchan remained silent, didn&apos;t even dare move. "You don&apos;t love me enough to consider me as your other half" A bitter smile and laugh escaped Shuka&apos;s mouth as her tears still didn&apos;t stop. Anju reached her hand towards Shuka&apos;s face and held it, wiping the flowing tears that seemed like there&apos;s no stop. "Im sorry....Im sorry if I ever made you feel that way...Shuka I love you...I really do...As much as you love me..." Anchan then hugged Shuka. The latter didn&apos;t resist. "Im sorry...for everything...for not doing a great job...for yelling at you...for snapping...for everything...Im sorry" Anchan apologized over and over again as she hugged Shuka tighter at each word as the said girl cried as well. "I have discovered a part of myself when I got to know you. There is nothing to be sorry about" Shuka smiled, a sweet one. "No! Anju no! 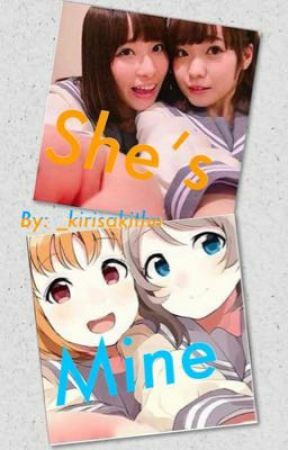 That&apos;s not what I meant...it&apos;s just...I think we just need a break from each other for a while....we&apos;ll just stay as friends for a while...." Shuka smiled. Actually, Shuka hesitated on this idea at first but now that she thinks about it, it&apos;s probably the right thing to do....at least...for now..
"Alright" Shuka replied and was about to go but stopped midway as she approached Anchan and lifted her chin as Shuka pressed one last kiss on Anchan&apos;s lips. "See you soon" Shuka smiled and left. Leaving a dumbfounded Anchan. A/N: Third Live is tomorrow. That&apos;s all I wanna say.